It is a traditional Chinese natural cure for insomnia handed down from generations. I love the sweet fragrant smell of long yan. It’s very appetizing and comforting. Long yan (also known as longan, “gui yuan” 桂圓 in Chinese) is a popular tropical fruit. The flesh is very sweet and juicy. I and my family like to eat it fresh, even though it’s quite pricey here in Australia. 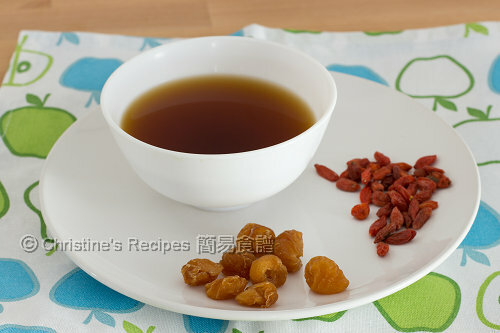 The dried ones, dark brown in colour, are less expensive, good for making Chinese soups, desserts and teas. In Chinese medicine, long yan is a natural cure for insomnia. 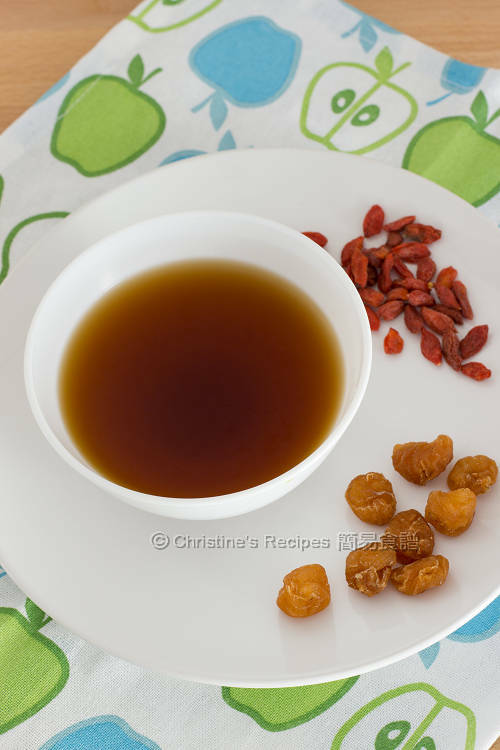 Goji (aka wolfberry, or Goji berries, 枸杞 in Chinese) is also found good for eye health, giving your a feeling of calmness and quality of sleep. My mum used to make this long yan and goji tea for me when I complained after a sleepless night. This traditional Chinese tea is handed down from generations. I love the sweet fragrant smell of long yan. It’s very appetizing and comforting. After moving to Australia, I have to make it myself and surely will pass the recipe to my daughter just in case she needs it. Rinse the dried long yan and goji with water. Use boiling water for the last rinse. Drain well. 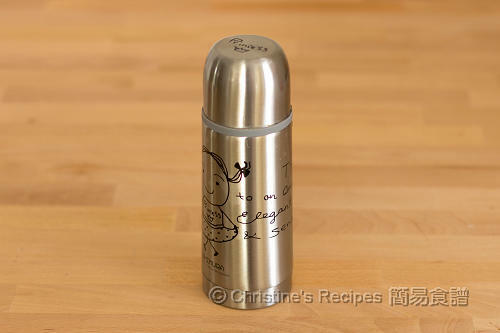 Use boiling water to rinse thermos flask. Put in the long yan and goji. Pour in 1 cup of boiling water. Tightly close the cap. Set aside for 3 hours. Enjoy the tasty tea! Some people drink this tea just before going to bed and find a more significant improvement to get better sleep. The downside is that you need to go to toilet in the middle of the night. I follow my mum’s method: Prepare the tea in the morning before work. And drink the tea in the evening. I can get a better sleep that night. Dried long yan and goji are available at Asian grocers. A very nutritious and warming drink...perfect for the cold days. Christine, do you know if this tea is safe to drink in pregnancy? I'm in my first trimester and would love to drink some warming teas. The ingredients used in this recipe are very mild and suitable for most people. If you don't have any allergy to these things, it'd be ok.